Coaching youth basketball can be summed up in two simple words: What and How. What are the most important skills to teach to beginners? How are you going to teach them at an age- and skill-appropriate level? First, let's look at the what. Here are 10 areas of instruction to consider. What do young players need? Ball control is one of the most important skills in the game. A player who can handle the ball with confidence can dominate on the court. Yet, few players spend the time it takes to develop strong ball handling skills. Encourage players to get a ball in their hands outside of practice. Daily dribbling drills are essential for everyone, regardless of age or skill level. Beginners as well as collegiate or pro players benefit from them because no one can ever have too much ball handling practice. Simple ball handling routines are a great place to start. Kids can experience some early success and see improvement pretty quickly. And as they get better, introduce more complex drills. Basketball is a team game. It works best when the ball moves quickly between teammates. Typically, it's much quicker to move the ball around the court by passing it as opposed to dribbling it. Yet, a lot of young kids have difficulty with the basic skills of passing and catching. Here are some good passing drills to make sure your players can get the ball to an open teammate and catch it when it comes their way. Don't expect basketball defense at the kindergarten/elementary basketball level to look very good. There are a lot of complex technical skills players won't understand or be able to execute until they get older. Defense is one of those skills. Regardless, it's important to start building a foundation. Introduce players to some basic defensive skills. Don't overload them, but pick a few concepts to start with and introduce new ones as your kids are ready. When coaching youth basketball players, start by introducing them to some basic rules. Don't throw all of the rules at them at once, but teach on an "as needed" basis as they relate to skills you're working on. For instance, while working on basketball dribbling drills, you could talk about traveling or double dribbling. 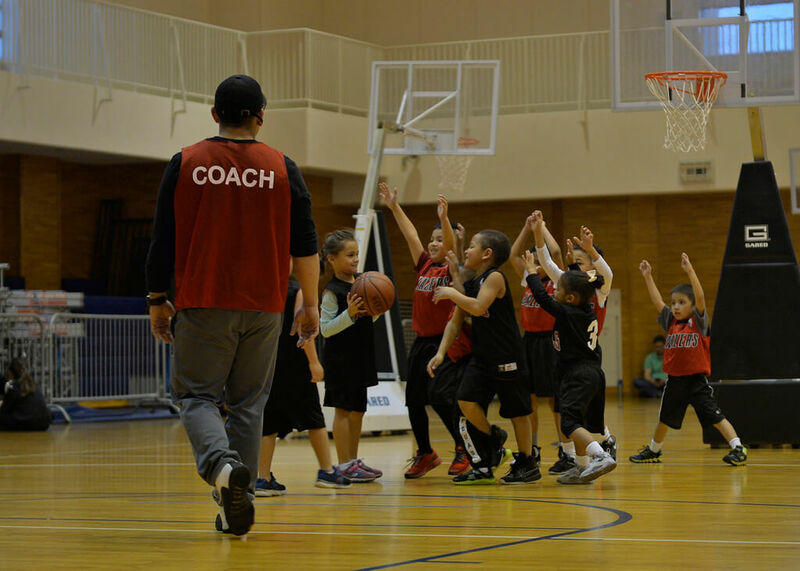 During youth basketball games for beginners, many officials stop the game to teach players the rules as fouls or violations are committed. This may seem a bit time-consuming at times, but it really is an effective way for kids to learn. Don't assume your kids know how to get up off the floor to reach the ball. It's a skill that takes timing and good hand-eye coordination. Young kids are often very hesitant to jump after the ball. You'll see a lot of standing and reaching, but very little jumping. 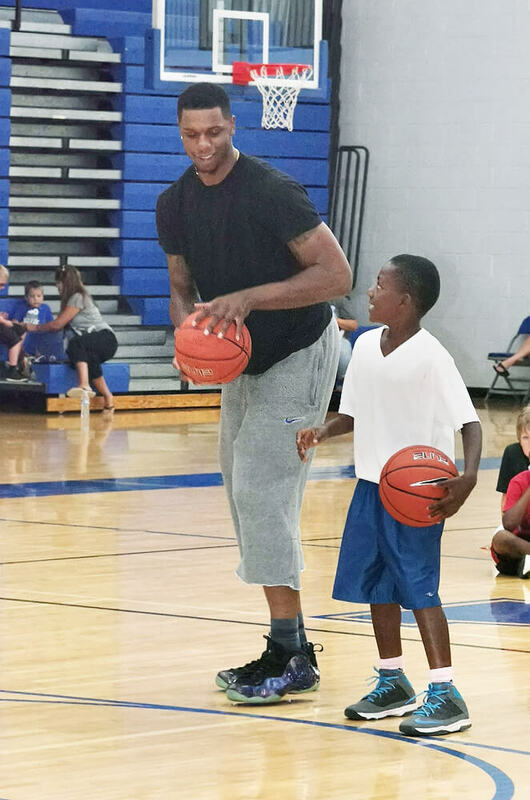 With the help of some good rebounding drills, your young players will learn how to grab more rebounds and get more shots as a result. I recommend teaching the basic mechanics of basketball shooting form as early as possible. At first, most kids will need to use two hands to shoot, and they may try to sling it from the hip. That's OK. They don't have the strength yet to shoot with one hand. You can still focus on other important parts of the basketball shot like what their eyes, knees, or feet should be doing. Make sure you set reasonable expectations. Youngsters won't be able to reach a regulation size goal with any consistency, and they may not have much success with a youth-size 8-foot goal. To keep them from getting discouraged, measure success in other ways. For example, mark a target on a wall and have players shoot to the target or into a trash can. Praise them for good-looking basketball shooting form and ensure them that when they get bigger and stronger their shots will go in. Include fun shooting drills and games to help them improve their skills. Teamwork games are a great way to help children's basketball players learn how to have fun working together. If kids are going to enjoy their time at practice, they have to feel like they fit in with the team, and the team has to have fun interacting together. Sharing the ball, encouraging teammates, working hard, and respecting others are all important concepts to teach. There are 5 positions on a basketball team. Physical size, athleticism, and fundamental skills help determine what position players are best suited for. In my opinion, youth basketball is not the time to predetermine what position a young athlete will play 5 years down the road. There's a time to specialize, but it's not in elementary school. During youth basketball training, expose all players to all basketball positions and give them opportunities to play all over the floor. Everyone needs a chance to bring the ball down the floor. How else are they going to learn to handle the ball? Every player needs a chance to shoot from the wing and to play underneath. Players gain different perspectives from every spot on the floor. Give them a broad range of experience at different positions. Young kids' bodies are very different from the bodies of adults. They can't handle the same type of physical stresses that the mature athlete can. No doubt, kids that are in better cardiovascular shape will have more fun and success on the court than those that tire easily. But getting in shape can happen in a variety of ways. Kids can run hard for short periods of time. But, then they need a rest. That's why tag games are so popular with them. They can play tag games all day long because they're fun. Remember this concept when it comes to conditioning. Basketball, like tag, is full of starts and stops. And there are all kinds of fun basketball shooting and dribbling games that provide plenty of aerobic activity without players even realizing they're getting in shape! One other thing. Though physical strength is an important part of basketball conditioning, it shouldn't be a part of training for young players until they're about middle school age. Children's bodies aren't physiologically ready for the stress that lifting weights puts on their bones and muscles until after puberty. No one likes to lose. But, in sports, there's a loser at the end of every game. It's crucial our kids learn how to win and lose. Keep it all in perspective. There's so much more to youth sports than winning the 1st grade league championship. In the bigger picture, we're training impressionable little people to become good sports as they grow older. It all starts with how we, as coaches, treat our players. How do we speak to them when they make a mistake or we're angry or we're losing? There's definitely a need to correct their mistakes and to address bad behavior, but the focus should always be on encouraging and motivating them to be their best. You set the tone. Your players learn how to treat teammates, opponents, and officials from you.